Would FDR Run Those 9/11 Ads? is the headline, I saw that and I said hmmm… “It’s no mystery why President Bush and his campaign aides have fought so hard to establish the legitimacy of their TV ads that include scenes from the September 11th attack and the World Trade Center. When the commercials came under criticism from survivors of some of those killed by the terrorists, and also from some members of the firefighters union, Republicans rushed…” Have you noticed how often you see my name in the news? I mean, this thing in Madrid they’re trying to blame me for it, rush hour bomb kills blah, blah. Didn’t even credit you, Mr. Snerdley, and you did the original research on this. So he and researcher Brian Faler went back to 1994 “when FDR, almost three years after Pearl Harbor, was running for reelection.” Now, you and I know the story, but I want you to hear how the dean of Washington journalists writes about it. “What you learn from such an exercise is that Bush is a piker compared with FDR when it comes to wrapping himself in the mantle of commander in chief. 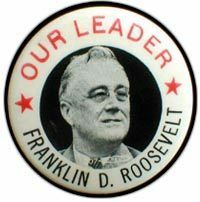 Item: FDR did not go to the Democratic convention in Chicago where he was nominated for a fourth term. A few days before it opened, he sent a letter to the chairman of the Democratic Party explaining his availability for the nomination. So he didn’t even go to his convention, he didn’t even mess with his nominating convention, he stayed on the campaign trail, invoking the need for the nation to keep him in office to avenge the acts of December 7th. Another item, Roosevelt delivered his acceptance speech to the convention by radio from the San Diego naval station. May as well have been an aircraft carrier. Can you imagine if Bush did that? Can you imagine if Bush delivers his acceptance speech after landing on an aircraft carrier again? That’s in essence what FDR did. He gave his acceptance speech to the convention by radio, from the San Diego naval station because he said the war waits for no elections, decisions must be made, plans must be laid, strategery must be carried out. 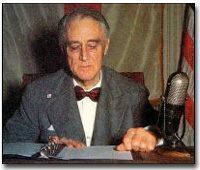 So not only did FDR not show up, he addressed it from a naval station in San Diego and had his flunky accuse the Republicans of being ill-prepared, ill-equipped and unconcerned about the war. David, David, you should have quit when you were ahead. Just had to get the little dig in, just had to. You may as well not even have written the first 95% of the column.